With the monsoon season ending in four to six weeks, the U.S. Navy is warning of increased pirate activity off the coast of Somalia. High seas in the Gulf of Aden have resulted in fewer attacks in recent weeks. But with the advent of weather more favorable to the sea-borne criminals, piracy incidents are expected to increase, the Navy said in a statement Monday. 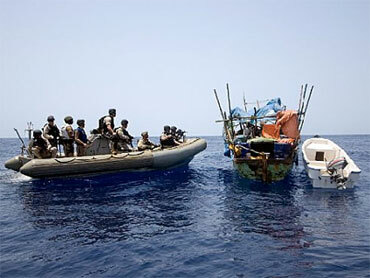 Somali pirates carried out hundreds of attacks this year. They currently hold around a dozen ships awaiting ransom payments. The Navy advised mariners to use a designated corridor when transiting the Gulf of Aden. The corridor is patrolled by 30 warships, supported by aircraft from 16 nations. On Saturday the Philippines, which provides about 30 percent of the world's 1.2 million merchant sailors, said it would contribute $20,000 to a U.N. trust fund to support Somali security forces in their fight against piracy. The Department of Foreign Affairs said in a statement that 44 Filipino sailors are currently being held by Somali pirates, who have severely disrupted shipping in the Gulf of Aden and Indian Ocean. The statement said the Philippines was "committed to help restore peace and security in Somalia." U.N. Secretary-General Ban Ki-moon has called on all countries to provide urgent military support to Somalia's embattled transitional government and the poorly resourced African Union peacekeeping force. The Horn of Africa country has not had a functioning government since the ouster of a longtime dictator in 1991 and is riven by fighting among clan warlords and an Islamist insurgency.